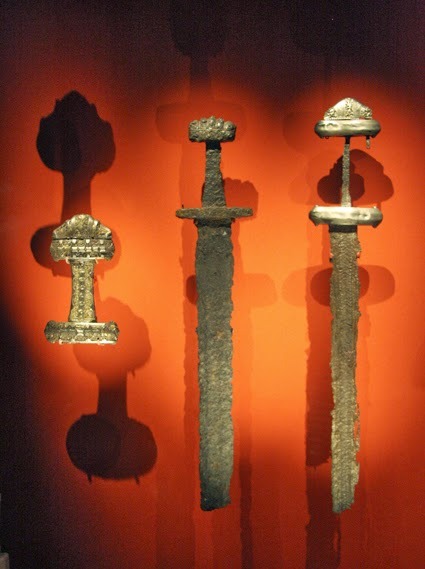 Forget the hoards of bling, the masterfully crafted weapons and the biggest longship ever discovered - what I found most exciting at the British Museum's Vikings exhibition were the belongings of a Scandinavian sorceress. 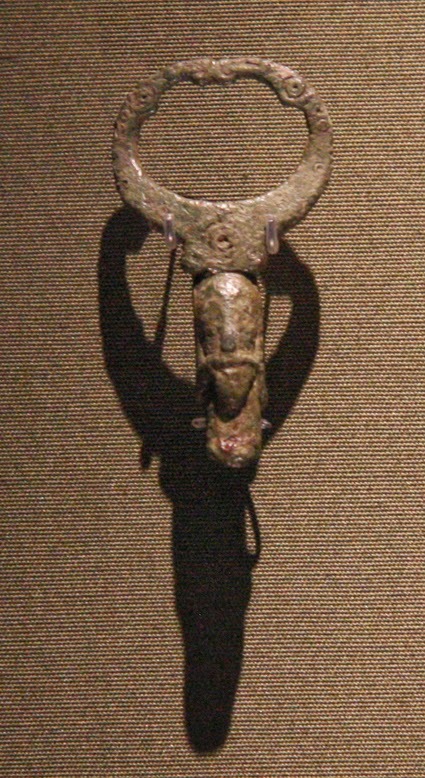 The description by the two iron staffs (pictured above) explained that the defining characteristic of a volva or Viking sorceress was her staff. The basket shape at the top is similar to a distaff, or spindle on which wool is spun, and it is thought that the volva may have used her staff to help her in shamanic journeys to other worlds. Many people who have experienced astral travel have felt or seen a thin silver thread connecting them to their physical body that allowed them to safely return from their out-of-body journey to the world of the living. Another display (above right) showed the grave goods belonging to a woman who was probably a volva. These included amulets, hallucinogenic henbane seeds, white facepaint and her staff. The exhibition also explained that women had considerably more equality with men in Viking society than in other cultures of the era. They were particularly valued for their skills in magic. 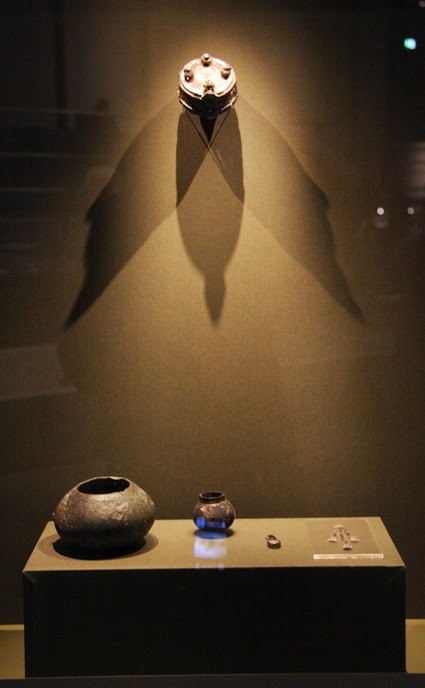 The photo to the left shows an amulet depicting the Norse god Odin and his two ravens - Hugin (thought) and Munin (memory) The ring at the top is formed by the two ravens beak to beak. It was one of a small display of religious items, including figurines of unidentified gods that were honoured by the pagan Vikings. Of course, if you are more into swords, ships and silver than magical and spiritual finds, there is plenty to feast your eyes on. You can see a selection of swords in the photo to the right. 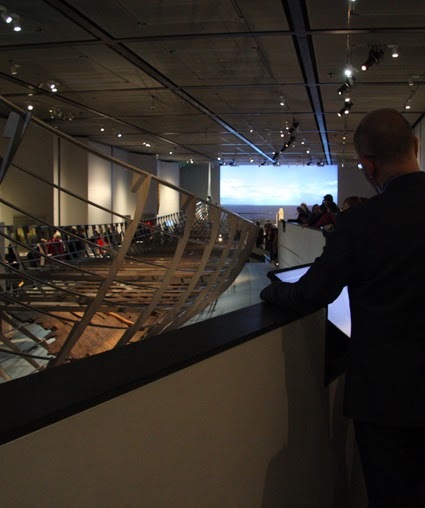 The remains of the longship takes up the length of the final room at the exhibition - but I have to say I was slightly disappointed. Most of it is represented by a wire frame because all but the bottom of the wooden boat had rotted away in the ground over the centuries. I guess that isn't too surprising, but I'd been expecting a bit more. The other thing that disappointed me was the fact that the exhibition was so packed with huge crowds that you had to queue for ages before each display case, often just to get a brief glimpse of what was inside over the shoulders of other people. At the end, I asked the attendant at the door when was the best time to view it without too many people there. She said that apart from becoming a member of the British Museum and getting an invite to a private show, it was best to come on a Friday evening, when it is open late until 8.30pm. So if you haven't got anything planned for this evening and are in London, see if you can get a ticket for Vikings: Life and Legend and hopefully enjoy it without the crush. The exhibition Vikings: Life and Legend is on until 22 June at the British Museum, Great Russell Street, London, WC1B 3DG. It is normally open daily from 10am to 5.30pm, with the last entry at 4.10pm, but is open late on on Fridays until 8.30pm with the last entry at 7.10pm. There is also a book out that you can order in hardback or paperback called Vikings: Life and Legend. We had a lot of trouble with the overcrowding too (and my sister's a member) - in the end we gave up queueing interminably for each item and just rushed round the outside to find things that particularly interested us. I wanted to see the items associated with sorcery and the gods and luckily we managed to get a good look at the wands etc. But it really is a super exhibition and I'll probably go to see Vikings Live at the local cinema to see all the artefacts I missed! Jennie, I agree with you and I am tempted with Vikings Live too. Excellent article, goign to reblog so thanks. Thanks for this! My experience of the Viking exhibition was similar to the tube in rush hour. With glimpses of gold. Plus the attendant stopped me taking photos, so I MUCH appreciate your report/pictures. I will have to go back (with my own oxygen supply) because due to the squashing I couldn't find the wands. In such a crowd it is impossible to sense any atmosphere. Unfortunately I don't think there is a quiet time. The attendant asked me to stop taking photos too - luckily I had already taken quite a few pictures by the time I was stopped. Just been back to the Museum to check out the new gallery that opened yesterday (Thursday 27th March) And there is a small Viking section! With another of the staffs. Plus plenty of room and space for contemplation. Not too happy about the British Museum's new exhibition. Witchcraft is 'evil'?? Mary - thanks for pointing out that this exhibition is coming to the British Museum. I wonder if it is the same exhibition that was on in Scotland last year? Have you seen a preview of it? I would certainly agree that the description that says "Witchcraft concerns the practice of evil" is offensive to modern witches. It might perhaps have been better phrased as "In history, Witchcraft was seen to concern the practice of evil." Still, I expect the exhibition itself will be interesting. Not sure if this exhibition has been on before. The good news is that I've had a positive result from my complaint to the BM. They have changed the description! The judgemental tone has gone. Result. Firstly, may I apologies for any offence that may have been caused, it was certainly not intended. To clarify a few further points for your interest - yes it is a version of ‘Witches and Wicked Bodies’ that was on show at Edinburgh last year, to which we lent about 40 items. The version here has been expanded to include many more prints and drawings from our own holdings, and has excluded the 20th century section. It also shows 6 further objects that explore the image of the 'witch' in addition to the prints and drawings. I saw in your blog that you are interested in coming to see the exhibition, I do hope that is still the case? That's brilliant, Jennie! They didn't answer me. So pleased with this result and with your alerts!